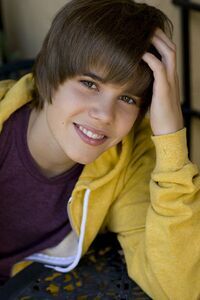 Justin Bieber (born March 1994) is a Canadian pop/R&B singer. At any given time, his name is likely to be a Twitter trending topic, or it was until Twitter effectively banned it by changing the algorithm by which the topics become trending. Bieber was discovered when a talent agent discovered his videos of him singing R&B covers in YouTube and promptly signed him; his early fanbase (and Hatedom) also developed in the site. During his career he has established an amount of records, including being the first artist on having 10 million of views in Vevo, having 7 consecutive singles chart first on the Billboard reports, and having had his videos among the most viewed in YouTube, with "Baby" being the most played video in the site between 2010 and 2013 (holding that record for 862 days until Psy's "Gangnam Style" overplayed it), and his video for "Sorry" still being among the 10 most viewed in the site as of 2018. He is one of the most polarizing pop singers of The New Tens, partly because of him being the most defining Teen Idol of the decade attracted a hatedom of unusual proportions, partly for him being touted as the poster boy of the increasing influence of social media on pop artist's popularity, partly for the increasing disruptions he had on his earlier sweet hearthrob image becoming tabloid fuel. The Other Wiki has a list of his remixes and singles. And the Fandom Rejoiced: In February 2018, the local history museum in Beiber's home town (Stratford, Ontario, Canada) put on an exhibit about his early life. The museum received hundreds of calls and emails a day about the exhibit (some from as far away as Europe and Japan), many asking about group admission rates - even before the exhibit opened, they were seriously considering extending the exhibit's run beyond the end of the calendar year. Cash Cow Franchise: Not only is there a movie, but there are also Bieber teddy bears, Bieber dolls (that sing! ), Bieber jewellery, Bieber kits, Bieber bedsheets... you name it. Dude Looks Like a Lady: Lampshaded. See the Super Bowl Best Buy commercial below under Self-Deprecation. Little Boy Blue Note: Inverted. He looks and sounds like he's yet to reach puberty, but in all actuality, he's in his twenties. But prior to that, it was played straight: "Never Say Never" featured clips from videos dating back to kindergarten which showed him singing and playing various instruments. The Movie: A 3D documentary on him, Justin Bieber: Never Say Never was released in theaters in 2011. Older Than They Look: He's older than he sounds, too. Pretty Fly for a White Guy: His outfits and sometimes his manner of speech fall into this. His love of the word "shorty" deserves special mention. Serious Business: His hatedom takes it to immense levels, to say the least. For the fandom meanwhile, his hair. Signature Song: Hands down, "Baby". That is usually the only song non-fans know (other than maybe "Somebody to Love" and "U Smile"). And maybe "Never Say Never". Stuff Blowing Up: His role on CSI. Roaring Rampage of Revenge: Again, his role on CSI. It was actually quite terrifying and got him an award.